Over the years I have done a few trips to Port Macquarie exploring the area and got some great photos along the way. Like Newcastle, Port Macquarie has a convict past, in 1821 Port Macquarie’s became the destination for convicts instead of Newcastle. These days like everywhere Port Macquarie is a great town, I find the CBD reminds me of Cairns for some reason. We have a growing collection of images of Port Macquarie. Click the blow link to be taken to the main gallery page. Brighton Beach from both angles looks fantastic. Due to the location of the beach to get a photo with that nice warm light you need to be there on sunset. This photo was taken after sunset so the ambient light of the setting sun lit the scene without being too harsh. We offer two types of posters in our online E shop. This is our panoramic poster range. Which retail for $25 each. The other is our square poster range (see below). Our panoramic poster range is 72cm wide and 36cm in height. All posters are printed to order, so they are brand new when delivered. Did you know that we also license out the images on our website for your own personal use whether it is for a website, print project, advertising campaign (online and print), glass splashback for your kitchen, wallpaper etc. All image use is subject to approval. 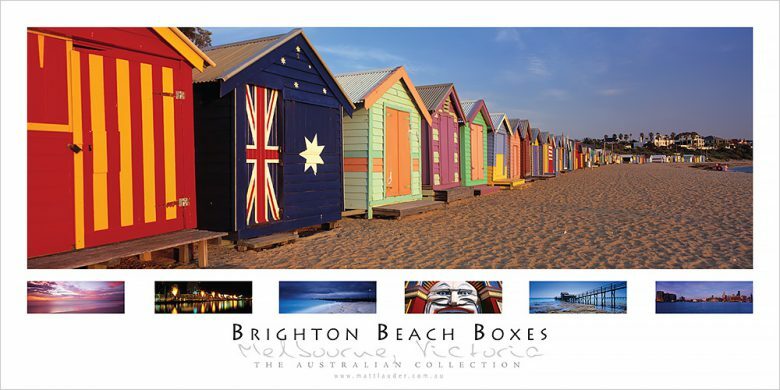 This image of Brighton Beach was recently licensed for use locally in Melbourne and will be used by the client on the side of local buses. 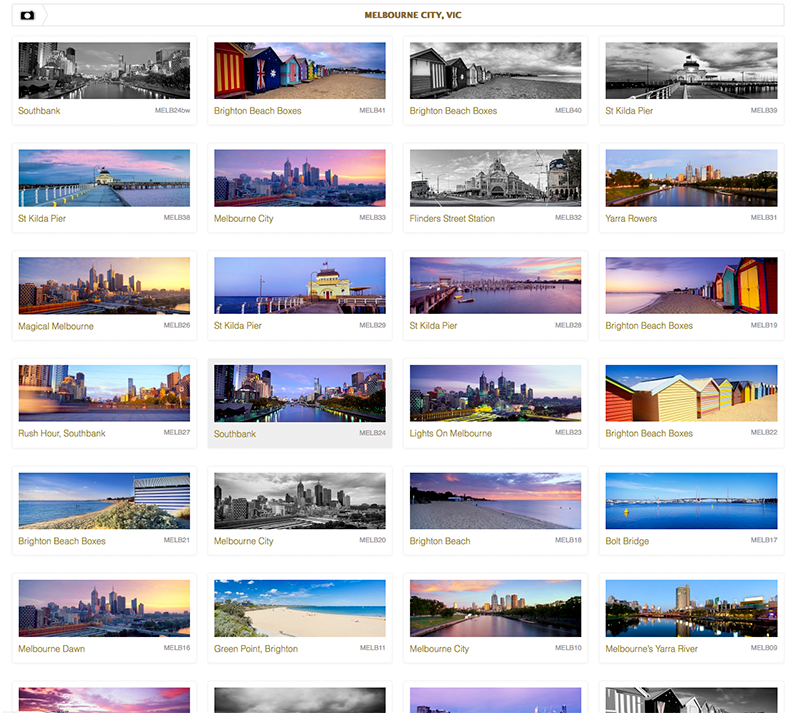 With our Melbourne collection of images we have been really lucky with some of the light we have been able to shoot, especially when you visit the area once a year for only four days of shooting. In the near future we will be making trips outside of Melbourne to Geelong and the Mornington Peninsula. 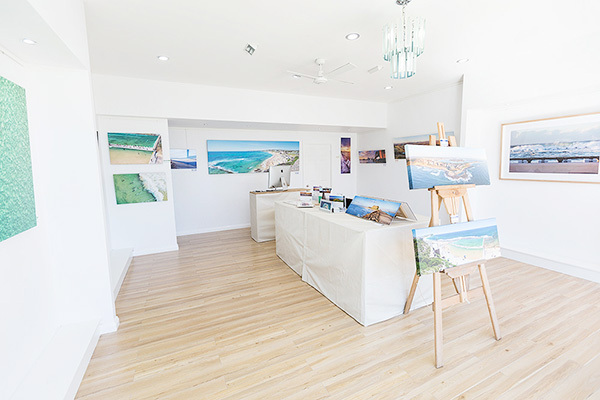 We have a gallery in West Gosford on the Central Coast of NSW. Our gallery showcases a wide range of work from the local area. In the gallery we have work on display and for sale that is Framed, on Stretched Canvas, Acrylic Face Mount (Glass) prints and also mounted. Our gallery is also home to our own print and framing lab Still Creations that is open to the public.